We sometimes hear (and know-next-to-nothings like me sometimes repeat) that the human brain is the most complex known object in the universe after the universe itself. The statement is so easy to make that its enormity can easily be overlooked. But every now and then a detail comes up that helps to drive it home. The process of neurotransmitter release is tightly orchestrated. Ready vesicles are ‘docked’ in the ‘active zone’ lying beneath the cell membrane, and are depleted when they fuse with the membrane, only to be replenished from a reservoir of pre-prepared vesicles located further inside the cell. Spent vesicles are quickly pulled back out of the membrane, reformed, refilled with neurotransmitter molecules, and then returned to the reservoir, so that they can be shuttled into the active zone when needed. An individual nerve cell may use up hundreds, or perhaps thousands, of vesicles every second, and so this recycling process occurs continuously to maintain the signalling between nerve cells. 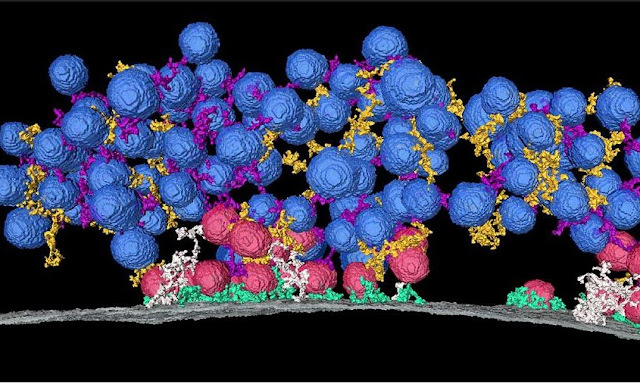 The nerve terminal contains more than 400 different proteins, which together form the exquisite molecular machinery that regulates the fusion, recycling, and movements of synaptic vesicles between the reservoir pool, active zone and cell membrane. Although modern molecular methods have revealed a great deal about the identity and function of many of these proteins, we still know very little about how they are organised at the nerve terminal, because the structures they form are extremely fragile, and researchers lacked appropriate ways of studying them. I was reminded yesterday (by this) of the term ‘hyperobject.’ It was coined for things that are so massively distributed in time, space and dimensionality that they defy our perception, let alone our comprehension. The creator of the term, Timothy Morton, had in mind the likes of climate change, mass extinction and radioactive plutonium. The brain of a human or another complex animal is a few pounds of jelly-like goo, but in its relation to time, space and dimensionality it also defies our perception. Note: A quadrillion is, apparently, about the same as the total number of ants on Earth alive at any one time, their biomass being approximately equal to the total biomass of the human race.